Andrew Hoadley of La Violetta Wines in Denmark/Western Australia (WA), pictured above, is a winemaker with a sense of irony that’s married to a great feeling for harmony, a combination that I haven’t come across in this form since I first met Randall Grahm of Bonny Doon in Santa Cruz/California for the first time more than 20 years ago. 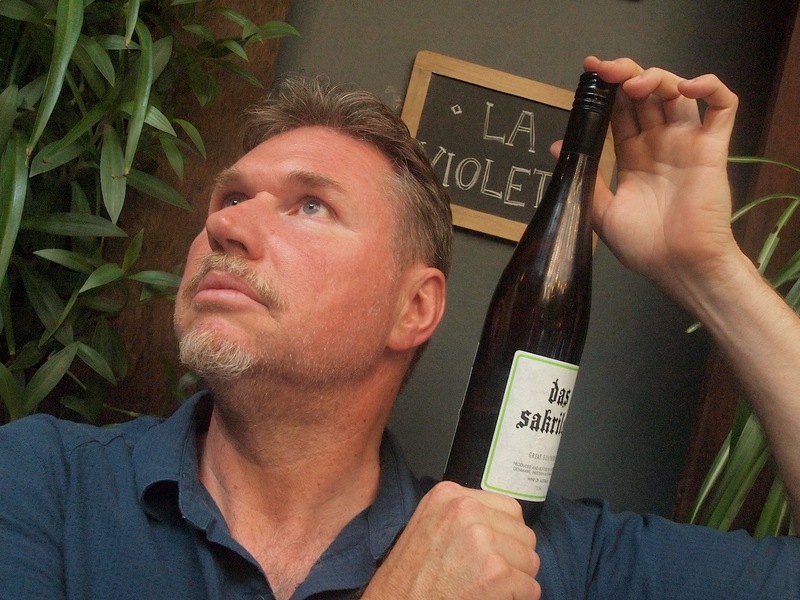 He’s holding a bottle of his 2014 “Das Sakrileg”, the sacrilege, a barrel-fermented Riesling in which the oak tannins are beautifully interwoven with the fruit tannins and the oak aromas do nothing to interrupt the flow of fruit aromas. That’s like squaring the circle and I can’t begin to explain to you how he did it, which is the best thing of all, the feeling that something miraculous happened that made this unexpected beauty not only possible, but seem inevitable. I had this – and several other epiphanies – at Jeremy Purs’ Lalla Rookh in Perth, surely one of the best wine bars in Australia (and the beers are great too!) during yesterday afternoon’s “Riesling Market” there. I would have posted this story earlier, but I was torn this way and that by the fun I was having and the jetlag plus I was suffering from. I add “plus” to the jetlag, because I always get a special form of disorientation when I arrive in Australia. Mentally I was chewing on that all day and evening, but now in the car en route to Frankland Estate I’ve finally got the time to hammer this out onto electronic paper. The next Big Surprise at the Riesling Market were the wines from Paul Hogan of Xabregas in the Porongurup Hills of WA. It started with the regular Xabregas Riesling which is dry, but has a whisker of natural sweetness that teases some charm out of the normally austere and smoky character typical for the Rieslings from these ancient granitic hills. Then there were Paul’s mind-bending Rieslings under the “Mad Men of Riesling” label. One of these is an NV, filled in a Champagne bottle with a crown cork, is a full-on orange wine with a dried orange peel character and dense dry tannins. I found the 2014 which did two weeks of skin contact more interesting, because the tannins were less dominant and more complex. These wines are only “mad” in the sense of being eccentric within the Australian context that was once more narrow and rigid than it is today. “Even 10 years ago I’d have been laughed at for doing this, but today it’s not a problem and there are some people out there looking for different wines,” he told me. Paul Hogan is one of WA’s great innovators and in few years some of the styles he has pioneered will have become established wine categories. The Gonzo Wine Show in Canberra is already offering Gold medals in several of them, and the mainstream shows usually lag just a couple of years behind the Gonzo. 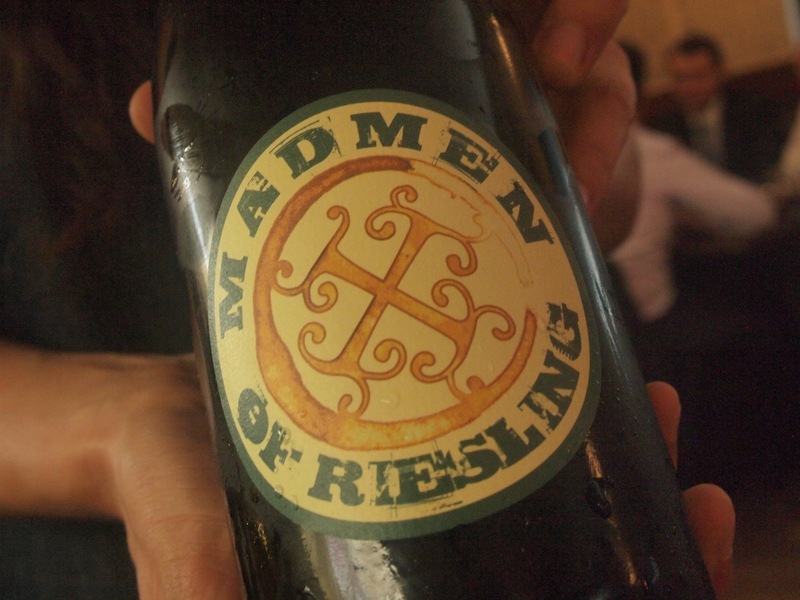 Stylistic innovation was also apparent in some of the dry Rieslings at the “Great Southern 2014 Snapshot” tasting organized by the Great Southern Winegrowers Association immediately before Riesling Market. To my mind the standout wines were those with extended lees contact, which had filled out the mid-palate, rounded the finish and also added something to the nose, most notably the 2014 from West Cape Howe in Mount Barker (when did I last encounter an Oz Riesling with a yellow peach aroma and this kind of salty minerality?) and the 2014 from Snake & Herring’s “High & Dry” (when did I ever encounter an Oz Riesling that smelt of dried seaweed and this kind of positive tannic power?) Congratulations are due to Tony Davis for the latter. The craziest thing about this wine is that the biggest customer for it is the conservative Marks & Spencer chain in the UK!